The holiday season, in particular, Christmas is approaching fast with only a month or so to the d-day. If you’re ready for Christmas, KenTex Cargo is ready to make this your best Christams ever! Christmas, and other gift giving occasions like Valentine’s Day, occur on the same day every year. Why is that so many people rush frantically to the one week or 24-hour Christmas Eve Special Offers? Get it done early. Special Offers are better earlier than later. After-all, the later you wait, the greater the chances you’ll not receive them on time! Why take the risk that you may not have the time or selection to find what you really need? This is the best time to start thinking about what you will get your friends and family and actually start planning for it. Christmas is a time to show your love in a totally materialistic way – with gifts. Buying presents is both rewarding and stressful, and that’s why we love it. But it can get expensive. how you can get them delivered right to your doorstep. Set a spending limit. Shop for gifts on a budget. This is probably the most important constraint of all. So keep in mind to check your pockets before going for anything as it restricts your buying decisions. Make a list. This will prevent you from making impulse online purchases and help you stick to the budget. Who are the gifts for? Boys/men and girls/women have different preferences when it comes to shopping for gifts. In fact there’s a world of difference between their tastes. Mostly boys/men prefer sporty stuff, electronic gadgets, toys, and watches etc. Girls/women have totally different taste for gifts, they prefer stuff like dolls, jewelry, fashion accessories, clothes, cosmetics, home décor or party stuffs, among others. How old are they? Age is another important factor to consider before buying gifts. Preferences vary with the age and gender. You can classify people in different groups younger/toddlers vary between age 2-12, teen ages 13-19, and then the adults above 19. Now their preference for gifts also varies as of their ages. Like the younger ones, mostly prefer toys for their gifts. Teenagers, on the other hand, have totally different and unique choices. They are more inclined to electronic gadgets like phones, clothes, music players, laptops and so on. For adults, gift giving becomes a more complicated task as their tastes become more choosy and versatile with their mature age. Now that you have,probably, put some thought on what gifts to get for your friends or family, the next step is decide where to get them from. We have compiled a list of U.S sites, where you can the best deals for gift items. 1. U.S Toy. US Toy is the only party supply store you need for all of your party needs. We offer luau party supplies, birthday supplies, masquerade masks, and much more for kids. 2. Toys R Us. Toys“R“Us is the leading kids store for all toys, video games, dolls, action figures, learning games, building blocks and more. 3. Disney Store. Disney Store is the official site for Disney shopping. Get the best deals on Disney clothes, costumes, toys, home décor, collectibles, movies, and more! 1. Forever 21. It’s definitely among the top stores for teens . Not only do they keep up with new and upcoming fashion trends, but they are also very affordable! Their styles range from crisp and classy to proud and sassy, plus they always have happy mediums in between. It’s worth check it out. 2. Hollister. Hollister is undoubtedly one of the most popular teen stores in the US. Its style is based around the worry-free teen who can look classy and laid back all in one. Hollister Co. is a prominent American lifestyle brand which focuses mainly on youth from 14 to 18 years. 3. Hot Topic. 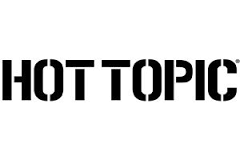 Hot Topic is an American retail chain specializing in pop culture inspired fashion including body jewelry, accessories, Rock T-Shirts, Skinny Jeans, Band T-shirts, Music T-shirts and accessories, as well as licensed music. 4. Asos US. ASOS.com is a British online fashion and beauty store but has a US site. Primarily aimed at young adults, ASOS sells over 850 brands as well as its own range of clothing and accessories. These are just examples of some of the specialty U.S stores that you can get some great Christmas gifts for your loved ones but the list is endless. For electronics and other general items like cosmetics, check out our post on other top U.S big box stores that we recommend here. How can I get my Christmas gifts delivered? After seeing all the limitless ideas for christmas gifts you can get for your loved ones, I’m sure what is heavy on your mind is how can I shop from these U.S websites and get them delivered right to my doorstep? Well, worry no more. This is where we as, KenTex Cargo, come in. As our slogan says, “Delivering Happiness…” our number one priority is ensuring your satisfaction through timely and hassle-free deliveries. This holiday season, with the best-in-class rates, we give you a smart way to enjoy savings when you shop for Christmas gifts for your loved ones. Learn more on KenTex Cargo can help you share joy and the spirit of Christmas with your family and friends, here. It’s my hope that this article has given you some insights on some Christmas gift ideas and sites that you can shop from the US. In case of any questions or additional sites that you can recommend, comment below. If you would like a quote from christmas gift items you might have loved from the sites suggested here, you can contact us here.